Children and young people tell us that family is crucial in developing their faith. BRF have released resources for families to use together to grow their faith. The Diocese of Chester has Parentalk resources by Care for the Family for parishes to run parenting courses should they wish. Contact Jonathan Masters for more information. 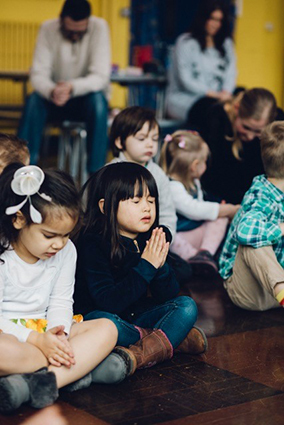 There are prayer networks in different localities across the Diocese praying for young generations in their area at least once a month, usually on the first Thursday of each month. If you would like to join one near you, or set one up in your locality please contact Jonathan Masters. There are a number of ways to help families feel welcome and to help them grow closer to God. We encourage Messy Church and Who Let the Dads Out? as two ways of being church with families. "You get to learn about Jesus and the Bible, it's fun!" Helen Ellis of All Saints Church, Hoole, Chester is the Messy Church Regional Coordinator for Cheshire and Wirral - covering the same area as Chester Diocese. She also works for All Saints as Family Work Coordinator. Helen writes about her own Messy Church: Our core vision was to reach out to the two areas of our parish that we have little contact with on a regular basis. Since October 2009 we have grown in number from four families who came to our first Messy Church to regularly feeding 50 or so people including the team. Messy Church gives our church the wonderful opportunity to present the Christian message to people of all ages from our community. Helen is very happy to be contacted if you would like her to talk to you and your church about starting up a Messy Church or to be added to the local email list. She is able to come and talk to individuals and/or PCC’s and has lots of resources plus the new Messy Church DVD which tells the story of Messy Church and explores the issues it raises. Register your Messy Church here. Who Let The Dads Out? is a growing movement that resources churches to reach out to dads, father figures and their children. They believe that to 'turn the hearts of the fathers to their children and the hearts of the children to their fathers' (Malachi 4:6, NIV 1984) is a powerful way 'to make ready a people prepared for the Lord' (Luke 1:17). We already have six groups running in our diocese. These groups run father and toddler sessions, but you can find other ways to bring fathers and children into the community of the church too. Visit the website for more information.